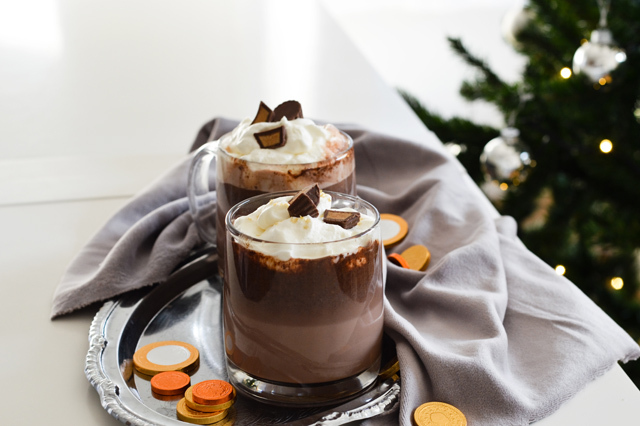 Peanut butter cup hot chocolate is here for all those chilly holiday days! Hope you’re not sick of chocolate just yet. Sooo, lot’s of hoping going on around here. My weekend has been great so far, very laid back, which is just what I need. 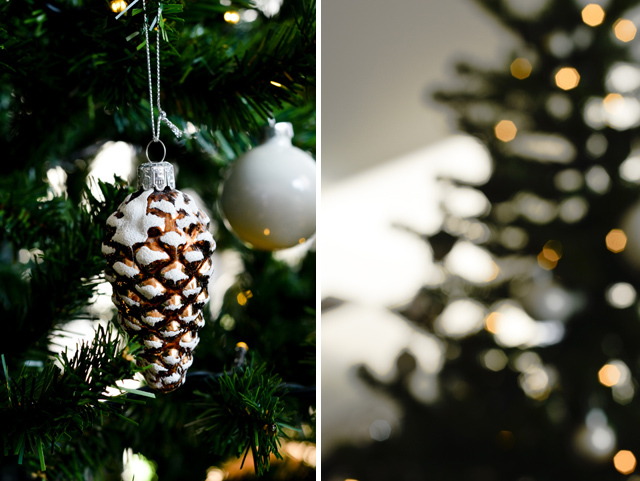 I’ve been indulging quite a bit, stuffing my face with chocolate, salad Olivier and pizza. Although my mornings have not changed. Just as any other day, I start my day with coffee and a banana or yogurt or a smoothie. Anyway, I’m here just to tell you you need to make some hot chocolate, if you haven’t already. 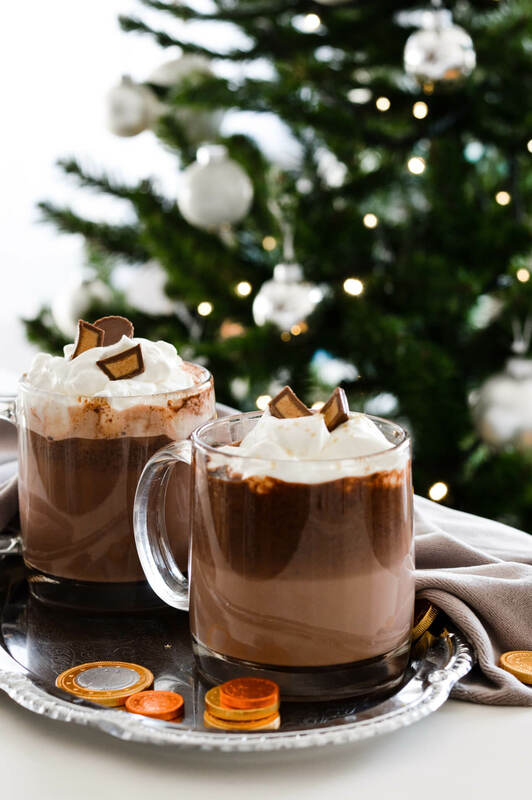 I really love a good hot chocolate or cocoa, but since it’s December (side note: I first wrote Decembeer and auto-correct didn’t even register it the first time) and all, I am indulging in peanut butter cup hot chocolate instead. Mini peanut butter cups are my guilty (and very sweet) pleasure, so I had this idea of melting them and making a drink. What a treat! I’ve seen similar recipes online, but many people only use the PB cups for decoration and still make hot chocolate from chocolate mixes. Some top all of that with a lot of sugar too. But if you do all of that you can quickly create a sickly sweet drink and that’s not what I want. 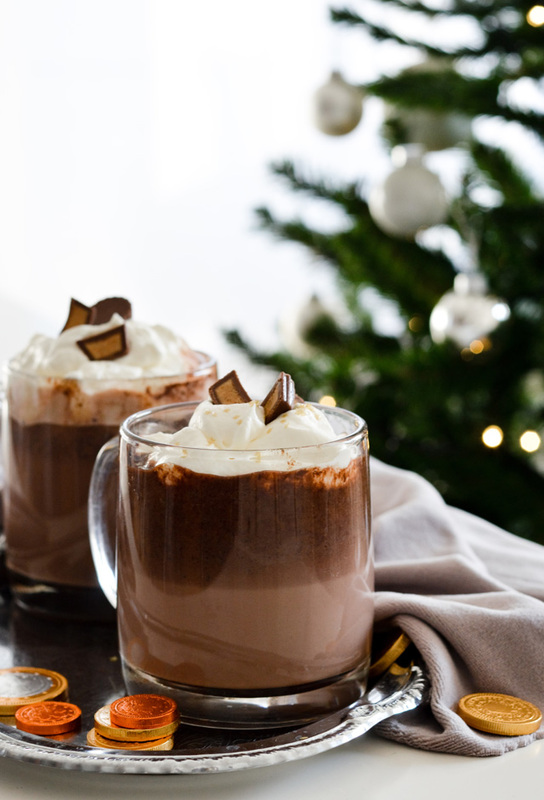 This peanut butter cup hot chocolate is a wonderful mix of part skimmed milk, melted peanut butter cups and lots of cocoa powder. The latter is insanely bitter, so it tones down the sweetness from the peanut butter cups and also makes the hot chocolate live up to its name. Because when someone makes you hot chocolate it better taste like chocolate. In this case it also has a salty pea-nutty aftertaste. 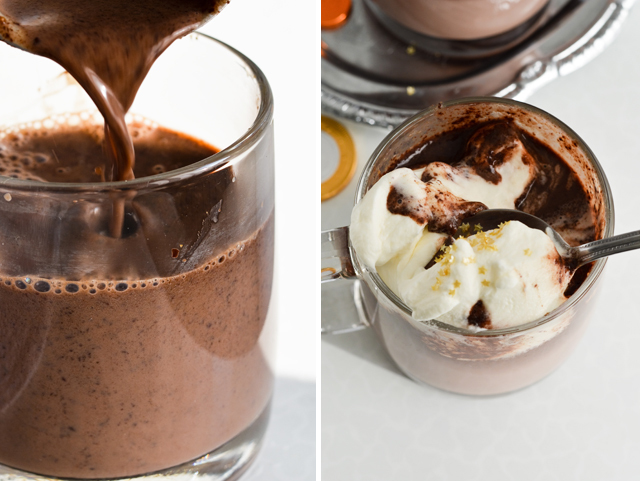 Very chocolaty and slightly salty, this hot chocolate is a real treat! Recipe serves 2-4 people and makes two large 400ml (13.5 fl oz) or 4 regular 250ml (8.5 fl oz) servings. In a heatproof bowl, set over a saucepan of simmering water, melt all the peanut butter cups (save a few for serving). Stir occasionally until they are almost completely melted. Remove from heat, keep stirring occasionally until completely melted and the peanut butter filling falls apart. Over medium high heat bring milk almost to a boil, until it begins to bubble up. 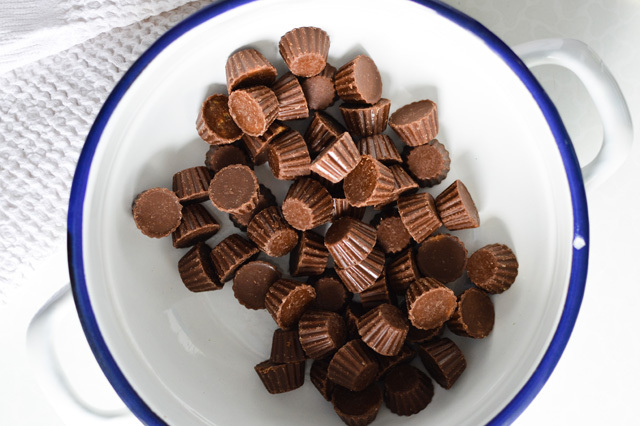 Transfer to the bowl with the peanut butter cups. Keep stirring until completely incorporated. 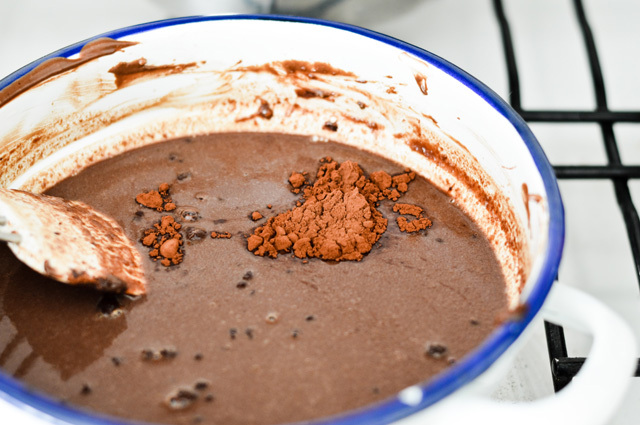 Lastly add the cocoa powder and chocolate (if using) and keep stirring until completely melted. If the milk cools too much as you do this, put it back on the stove and cook the hot chocolate over medium heat. Keep stirring until chocolate and cocoa dissolve. Serve warm, topped with whipped cream and additional peanut butter cups. I use Dutch processed cocoa powder, usually by Green & Black’s (available on Amazon or in your grocery store). You don’t have to use dark chocolate. I like to add some, if I have it on hand, but it does the same trick as cocoa powder. 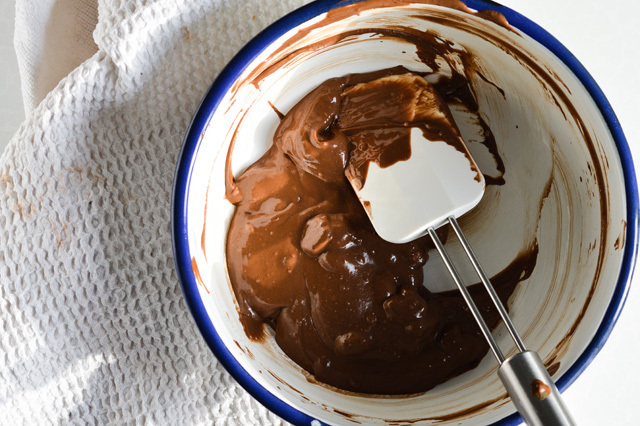 If you don’t have cocoa powder, then add more dark chocolate. Add as much cocoa as you wish. I find that 5 teaspoons are the bare minimum and anything more than that depends on how sweet you want the hot chocolate to be,. 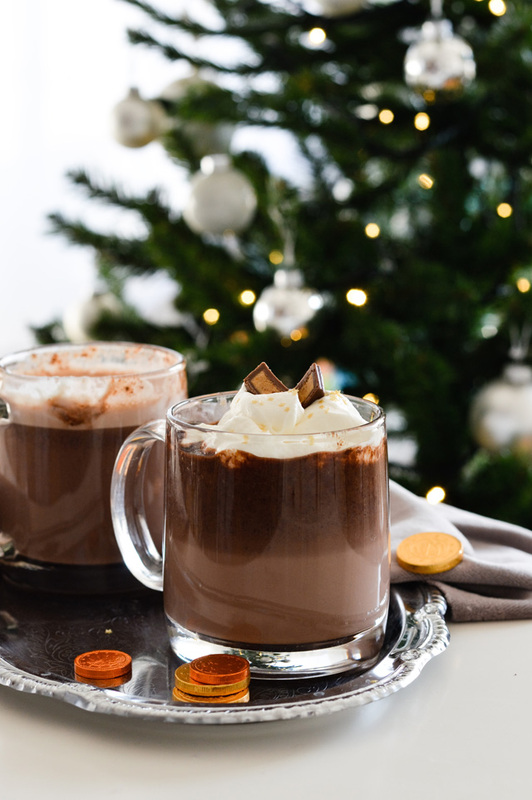 The more cocoa you add, the more chocolaty and less sweet the hot chocolate is in the end. 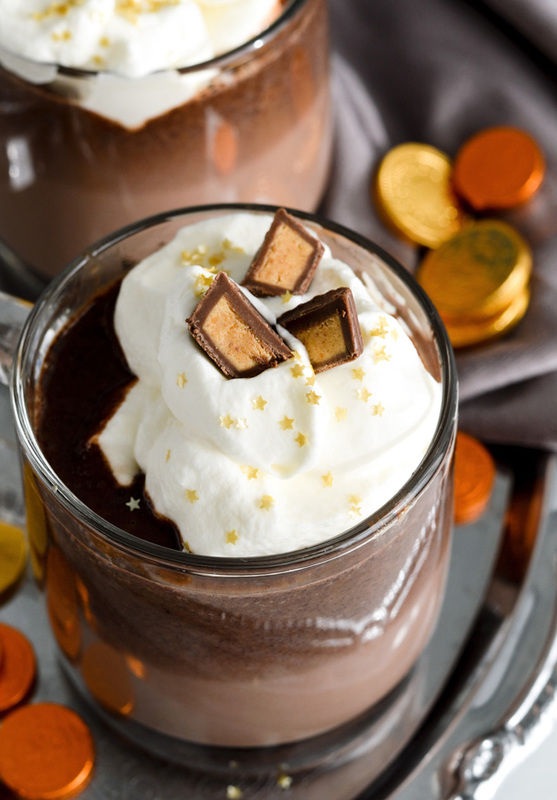 This hot chocolate isn’t thick, but you might see tiny specks of peanut butter floating around. If you want to avoid all of that, I suggest you pour the hot chocolate over a sieve. Personally, I don’t mind it at all. It’s all tasty and drinkable. 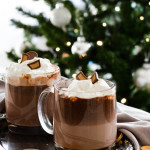 I originally served this hot chocolate in two 400ml (13.5 fl oz) mugs, but realized that once you add the cream and additional PB cups these servings can be too big and too filling. My suggestion is that you serve this hot chocolate in 250ml (8.5 fl oz) mugs. Oh, that’s something for me 😀 Maybe with an additional tbsp of natural peanut butter … Perfect! Happy to hear that! 🙂 And you can always add extra peanut butter or even use that instead of the PB cups, if you want.